like a cheeky little child. hanging on a 20mm vintage brass chain. and leave an extra comment telling me so. I would buy (and actually might) the Wise Little Owl Necklace. Because I am obsessed with owls. Call me a compulsive owl buyer! Oooh this is such an amazing neclace!I follow you! I follow you!! this necklace puts a smile on my face!!! My fav item is the personalized love letter... could something get any more perfect? dont think so? It's just pretty pretty pretty!And cute!With a sweet melacholy in it! My favorite is definitely the one you're giving away..the time traveler necklace. I absolutely LOVE skeleton keys and always pick them up at flea markets and I've turned a few into necklaces. Of course, all the items in the shop are beautiful. i love all of them. the time traveler is my favey though. and i too am a follower. kind of hard to decide! Actually my favorite is the one you're giving away! It is adorable - I love the key. It's simple, adorable, shiny & silver! Too cute! Also, I just became a follower after I found your blog from a Happy Birthday message you had left for me. Thank you! And I've been following your blog for some time now. Have a great Monday! WOW! Where is this view from??? i love the blushing coral rose earrings! My fav is definitely the Le petit papillon rouge. Necklace. I'm obsessed with butterflies, so I love it. I'm already a follower too!! Can I also just say how GORGEOUS that photo is... you took that picture? I wish I had the weekend you did!!! What an amazing view! 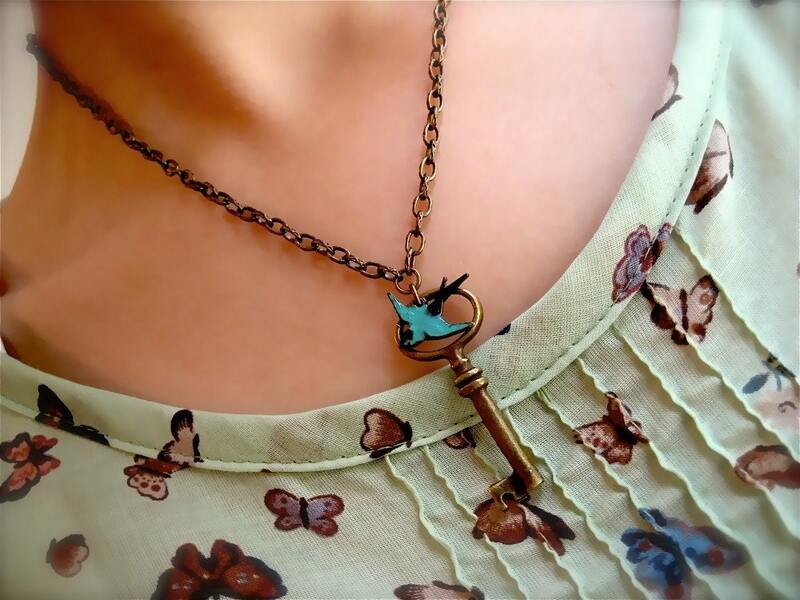 The time traveler necklace is beautiful, but the bird in flight necklace really caught my eye -- I love how simple and pretty it is. Great giveaway! I'm so glad you stopped by my blog. I am and have been following you! I really like the Personalized Love Letter Necklace. How romantic! my vote goes to the olive green owl necklace. the Pretty Little Lovelies for Cloudy Afternoons is one of my favorites in the shop! the color is gorgeous and i would so rock these on a night on the town. I like the Flopsy, Mopsy and Cottontail necklace. Why do I like it? Well, my brother died two years ago and my mom says that whenever she sees a bunny, it's my brother visiting her. I think this necklace who be a great gift for my mom because it would represent the three of us. I love the Le petit moineau bleu necklace. I have always been drawn to it. It would be a beautiful gift to my beautiful daughter. Oh nice a giveaway. I love that olive green owl necklace. It is adorable! the key reminds me of the key to your heart, which i wish i held, but alas, i do not. le sigh. love you lady. I love this one! Also the love bird earrings :) Is it Thursday morning there yet?